'Benidorm Bastards' is an edgy hidden camera show in which 7 elderly people are the protagonists. They go into the streets with only one mission: pulling pranks on the youth. 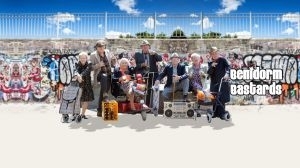 'Benidorm Bastards' may be seen as the revenge of the third age on the 'Trigger Happy' TV series, in which the victims were mainly senior citizens.